Several genetic determinants responsible for individual variation in gene expression have been located using linkage and association analyses. These analyses have revealed regulatory relationships between genes. The heritability of expression variation as a quantitative phenotype reflects its underlying genetic architecture. Using support vector machine regression (SVMR) and gene ontological information, we proposed an approach to identify gene relationships in expression data provided by Genetic Analysis Workshop 15 that would facilitate subsequent genetic analyses. A group of related genes were selected for a shared biological theme, and SVMR was trained to form a regression model using the training gene expressions. The model was subsequently used to search for and capture similarly related genes. SVMR shows promising capability in modeling and seeking gene relationships through expression data. In genome-wide linkage and association analyses using gene expression data from individuals in 14 CEPH (Centre d'Etude du Polymorphisme Humain) Utah families, Cheung and colleagues [1–3] found that variation in the expression level of the gene chitinase-3-like 2 (CHI3L2) was associated with a single-nucleotide polymorphism (SNP) marker, rs755467, in its promoter region. Other studies have also suggested that variation in a regulatory region of a gene is probably the main mediator of phenotypic divergence in evolution [4, 5]. The expression variation pattern correlates with the genes' genetic architecture. The characteristics of expression variation patterns of genes in a biologically defined group may also describe the landscape of the genetic architectures of the genes. We proposed an approach to determine gene relationships on the basis of expression data so that the underlying genetic and biological classification can be established. Our approach will be useful in expression studies, which usually deal with thousands of genes. where ξ i and ξ i ∗ MathType@MTEF@5@5@+=feaafiart1ev1aaatCvAUfKttLearuWrP9MDH5MBPbIqV92AaeXatLxBI9gBaebbnrfifHhDYfgasaacH8akY=wiFfYdH8Gipec8Eeeu0xXdbba9frFj0=OqFfea0dXdd9vqai=hGuQ8kuc9pgc9s8qqaq=dirpe0xb9q8qiLsFr0=vr0=vr0dc8meaabaqaciaacaGaaeqabaqabeGadaaakeaaiiGacqWF+oaEdaqhaaWcbaGaemyAaKgabaGaey4fIOcaaaaa@30ED@ are slack variables that define the "soft margin" to measure the deviation of training samples outside the ε-insensitive zone and C is the regularization parameter that determines the trade-off between model complexity (flatness) and the degree to which deviations larger than ε are tolerated in the optimization formulation. We selected a certain number of genes in a defined relationship, e.g., sharing the same biological functions or protein family, as a training sample for SVMR with defined parameters (kernel functions, ε, and C), to learn their expression patterns. The learned SVMR was then used to "recruit" new expression data of another gene from outside the training set. With predefined criteria, SVMR judged whether the new gene belongs to the same group. The newly recruited genes then grew into a category of a relationship that is expected to show similarity with the defined relationship in the training set. Comparison of linkage analysis results, ontology information, and/or regulation pathways of the new genes with the existing ones will further evaluate the search results. We devised a four-level search strategy to explore this approach: search within highly correlated genes, search within the genes of the same biological family, search using trained genes in one biological family over ones of another biological family, and "random walk" search using randomly picked genes to search randomly in the whole sample set (Table 1). cDEAD, DEAD box proteins, which are characterized by the conserved motif (Asp-Glu-Ala-Asp) (DEAD). dThree pairs of highly correlated gene expressions as three separate training sets, and search separately back in the sample, and found itself and the others. Study subjects were 194 individuals from 14 CEPH Utah families with 2819 genotyped SNPs across 22 autosomal chromosomes provided by Genetic Analysis Workshop 15. Expression data using 3554 gene probes in lymphoblastoid cells of the above subjects were obtained using Affymetrix Human Focus Arrays. Gene annotation and ontology information were available on 8793 genes, including the 3554 genes probed. The gene expression data were tested for normality using Shapiro-Wilk and Anderson-Darling tests, and pair-wise correlations were tested using Pearson's correlation test for normally distributed expressions and Kendall and Spearman's test for non-normally distributed expressions. These tests were performed for all phenotypes that were stratified by generations in order to guide a better comparison in later relationship searches. Quantitative trait locus (QTL) nonparametric linkage (NPL) linkage analyses were carried out using Merlin 1.0.1 for nonparametric QTL with options -qtl and -npl over the 2819 autosomal SNPs. This QTL NPL approach in Merlin provides nonparametric LOD score using quantitative trait-based on a general framework defined in the program's documentation . We used the "1-Mb-to-1-cM" rule to convert the physical map into a genetic one. As a supplemental analysis, QTL regression analysis using Merlin-Regress was performed. We broke down the given gene ontology information into minimum meaningful phrases and uploaded it into a database using mySQL4.1 for easy query. Genes of a biologically related group were selected using definitions in a database search, e.g., "ribosomal proteins" and "DNA repairing". We used mySVM  for SVM regression. Once the training data were formed, the target data were assigned either randomly or in a predetermined manner, depending on the search scenario used. The predicted results were then compared with the observed values of the targeted gene, and the mean and standard deviations of the differences were calculated. The final rank of the results was based on both mean and standard deviation values. The lowest values ranked the highest, and usually the top 0.6–1.2% genes were selected as captured targets for further studies. Two types of kernel functions were used: dot and polynomial, with degree 1 through degree 4. The biological relationship of the targeted genes to the training genes was inspected, comparing both genome-wide linkage results and ontological description and/or regulation pathways using PathwayStudio with ResNet 3.0 database (Ariadne Genomics, Inc.). 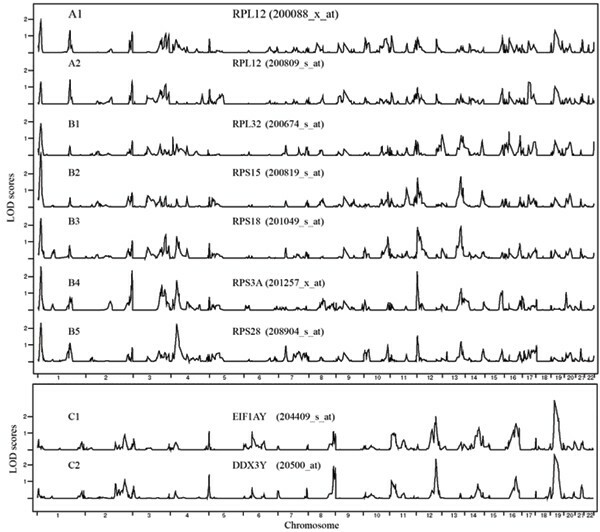 Both non-parametric QTL linkage analysis and QTL regression linkage analysis were performed for selected genes on 22 autosomal chromosomes. Our results showed the NPL LOD scores ranged between 1 and 4.92, and the regression LOD scores fluctuated more dramatically, e.g., some LOD scores were >20. We compared our QTL NPL results with those of Morley et al . Of the 10 genes previously charted, we were able to find 9 in our 3554-gene expression data, and the comparison showed 5 of the 9, including CHI3L2, DDX17, and ALG6, were highly comparable in genome-wide LOD score distribution (Fig. 1). Three of the remaining four showed partial matches for distribution of LOD scores (either the relative peak height/width or location was slightly different). HOMER1 showed the least agreement with results from Morley et al. Results of genome-wide linkage analysis of fourselected genes. Linkage results for expressions of four genes that were compared with the ones presented in Morley et al. . The Affymetrix probeset IDs are listed in parentheses. We chose three pairs of highly correlated gene expressions as three separate training sets for SVMR and searched separately in a subset of 1000 genes that contained highly correlated genes. As we expected, the correlated expressions showed strong parallelism in their genome-wide LOD score distributions (Fig. 2 and Table 1). Highly correlated expressions show similar linkage analysis results but may not be biologically related. Expression data from groups A and B are highly correlated and they all belong to the same biological group, ribosomal proteins. A1 and A2 are from the same gene, RPL12. Correlation coefficients for expression of genes C1 and C2 are > 0.987, but they appear to share no direct biological relationship, even though their NPL LOD score distributions show high similarity as well. We selected a group of genes from the same biological family, a set of 55 ribosomal protein genes. We found this group of genes closely shared similar biological functions, but not all were correlated in their expression data. We ranked the searched genes by the mean and standard deviation of the difference in expression levels between the selected gene and the one predicted from SVMR. If any search identified its own training genes, a high score for accuracy and specificity was given. Measurements of matching included both expression variation patterns and genome-wide LOD distribution (how many peaks in size and location along 22 chromosomes were matched or missed), and either a positive or negative point was scored for its sensitivity (Fig. 3 and Table 1). 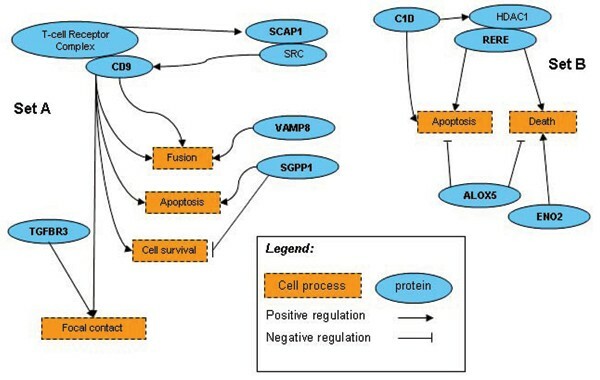 SVMR training and searching results in one biological family – ribosomal proteins. 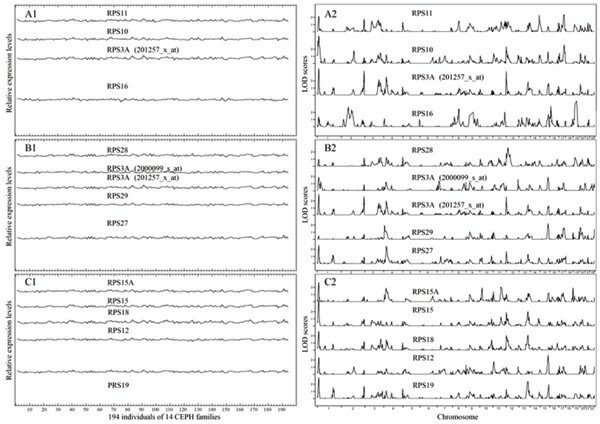 Expression pattern (left) and genome-wide NPL LOD score distributions (right) of ribosomal protein genes. Group A is the genes selected for the SVMR training set. Groups B and C are the genes that were targeted and captured in two separate SVMR searches. We observed increasing specificity as the training set size grew, which seemed to taper off at a training set size of around seven genes. The sensitivity fluctuated slightly when the training set size was two or three but remained at over 96% when the size grew to four and above. A larger training set (with more than seven genes) may overfit the feature, causing difficulty in finding similar targets in the limited gene pool. A similar result was obtained in a zinc finger protein (ZFP) family (Table 1). Using SVMR trained with only ribosomal protein genes, we searched a pool of another group of genes. Because of our limitations in time and computational resources, we made one attempt with a training set of three ribosomal protein genes (RPS4X, RPS4Y1, and RPL18), two being relatively "flat" in expression variation and one fluctuating more dramatically. We then formed two separate pools of targeting genes, one from the ZFP family and another composed of DEAD box protein genes, which are characterized by the conserved motif Asp-Glu-Ala-Asp. The results of this search strategy are given in Figure 4 and Table 1. SVMR searching results across biological families. 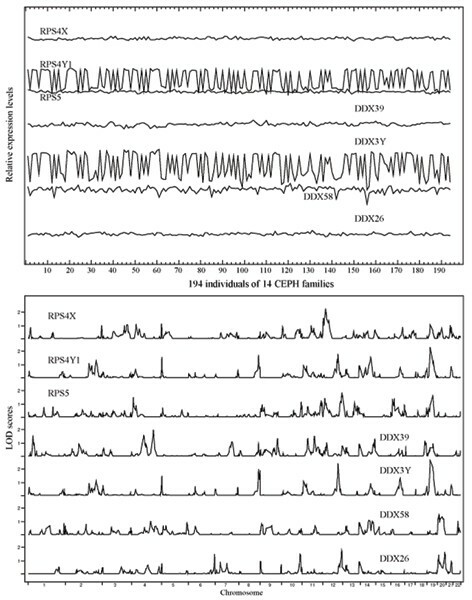 Expression pattern (top panel) and genome-wide NPL LOD score distribution of genes in training set (three ribosomal protein genes, RPS4X, RPS4Y1, RPS5) and the four captured DEAD box genes (DDX39, DDX3Y, DDX58, DDX26). We wanted to be able to discover a relationship directly, using gene expressions to form a training set and subsequently capturing a similar relationship. A random walk was designed to determine the size and makeup of a training set randomly and then to search a full set of gene expression samples randomly. This obviously required very heavy computational support. Therefore, we ran a short version of the plan and had a brief view of the random search outcome. We randomly searched in the full set of expression samples. The total random walk was run in 30,000 rounds (one round equaled one training set with one set of randomly picked genes for prediction tests that was run once with each of the three kernels but scored together at the final stage). The top 1% scored targets were kept as candidates for further estimation of their biological relationships and/or genetic analysis. A randomly formed training set created a combination of genes with no pre-defined biological relationships. The expression variation patterns and linkage results were also different. Sometimes, matching expression data were overthrown by a contradictory linkage result and/or biological ontology description. This short version of random walk certainly only covered an infinitesimal fraction of the entire search space. In the 30,000 random runs, we only encountered one repetition of the same set of genes picked for the training set (but the testing set was different). However, we found two sets of genes, one from the training genes search and another from the subsequent search of the full set of expression samples, and each set had its connected regulation pathways (Fig. 5 and Table 1). Genes in set B that formed the training set, C1D (200056_s_at), ALOX5 (204446_s_at), ENO2 (201313_at), and RERE (200940_s_at), captured the ones in set A, SCAP1 (205790_at), TGFBR3 (204731_at), SGPP1 (221268_s_at), CD9 (201005_at), and VAMP8 (202546_at). Interestingly, the five genes in set A are all linked in the same region on chromosome 2, but set B doesn't have such characteristics (linkage results are not shown). How to relate the two sets of genes in terms of their biological connection or similarity remains to be further elucidated. Biological pathways of two groups of genes from "random walk" search. Genes in set B were randomly picked for the SVMR training set, and then a random search of the gene pool hit a group of genes that formed set A. The pathway reconstruction was done using PathwayStudio 4.0 (Ariadne Genomics, Inc.). The pattern in gene expression variation does contain information that reflects the underlying genetic architecture. Using statistical learning machines like SVM can extend the capability to model more complex relationships with which regular statistical models such as regression may have limitations. In our exploration at four different searching levels, we noticed that the selection of genes for the training set, i.e., the definition of a biological relationship, influences the search results considerably. Meanwhile, the SNP composition and density, the heritability of expression data as a quantitative trait, and its distribution mode are major factors affecting both linkage results and SVMR learning quality. We suggest that carefully processing expression data may help manage the data complexity, for example, through distinguishing heritability level, normality of phenotypic distribution, age stratification, or partitioning data using a defined theme to reduce noise level. But adding one or more dimensions of biological relationship information into the SVM learning process may increase the searching power by improving its specificity and sensitivity. Our brief attempt at using the random walk method sheds light on the difficulty of discovering gene relationships directly via expression data. Genes in the same regulatory pathways share patterns of expression. Therefore, instead of searching an entire sample space, we plan to focus future research on adopting more effective search strategies such as those using genetic algorithms or other heuristic search approaches.